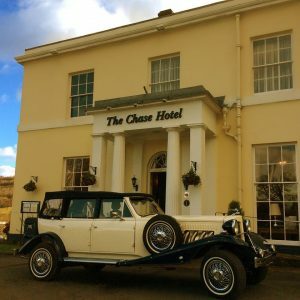 Set in 11 acres of peaceful parkland, the Chase Hotel makes an idyllic venue licensed for wedding receptions, civil ceremonies and partnerships. 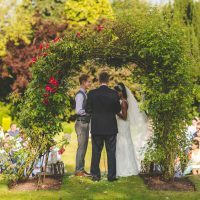 The traditionally decorated Georgian Country House Hotel, makes a stunning backdrop to your celebration, catering for up to 300 guests. Step through the magnificent columned entrance into the lavish reception area, that features a sweeping grand staircase, stained glass windows and stunning marble columns. 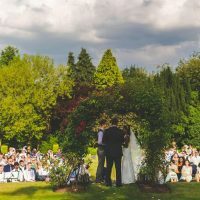 Surrounding the hotel are stunning award winning gardens, landscaped lawns and 70 seat garden terrace provide a romantic setting for fair weather ceremonies and receptions. Take advantage of the 38 traditionally decorated rooms with the option of Standard, Superior, Executive and Four Poster Rooms. Equipped with modern facilities including wifi and tv you can enjoy a peaceful break following or leading up to the celebrations. The huge choice of set packages to choose from can be tailored to suit your needs for total flexibility. 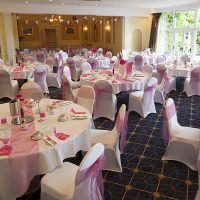 The largest setting is the Oak Suite catering for up to 150 guests. This lavish room provides a bright and airy atmosphere with access onto the terrace and stunning views of the grounds. This gorgeous space is ideal for up to 80 guests and features a separate entrance, full-width panoramic windows and splendid views over the beautiful gardens. Catering for up to 40 guests, Harry’s restaurant is tastefully decorated in neutral tones providing a versatile backdrop for your decorations. 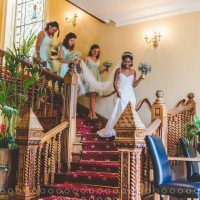 Situated next to the main foyer with its grand sweeping staircase, it provides a romantic backdrop for your photographs. Perfect for intimate gatherings, the Chase Lounge offers a bright and naturally lit space with sensational views over the grounds. The talented catering team pride themselves on using the finest, locally produced ingredients to create a wide menu of British flavours with European influences. To discuss your needs please 01989 763161 or use the online enquiry form.